The massive new reference work from the managing culinary directors of Serious Eats is an essential in any kitchen. What’s special: An authoritative, instant-classic reference book that’s also an engaging read. Lopez-Alt, managing culinary director of Serious Eats, is the Science Guy of the kitchen, offering thorough investigations of the best recipes and cooking methods for everything from crispy French fries to a mind-blowing Bolognese sauce. Upcoming appearances: A happy hour at Chefsteps and a cooking class at The Hot Stove Society are already sold out, but tickets are still available for Lopez-Alt’s appearance at 7:30 p.m. Thursday, Sept. 24, at Town Hall. He’ll talk about “The Science Behind Better Cooking” with Sansaire founder Scott Heimendinger. Cost: $5 (townhallseattle.org). 1. Adjust the oven racks to the upper- and lower-middle positions and preheat the oven to 450°F. Place the potatoes in a large saucepan and cover with cold water by 1 inch. Season generously with salt. Bring to a boil over high heat, reduce to a simmer and cook until the potatoes are just barely cooked through, about 10 minutes (a knife or cake tester inserted into a potato should meet little resistance). Drain and transfer to a large bowl. 2. Add the fat and a few generous grinds of pepper to the hot potatoes and toss well; the potatoes should end up with a thin coating of potato-fat paste. Spray two rimmed baking sheets with nonstick cooking spray (or coat with a thin layer of oil). 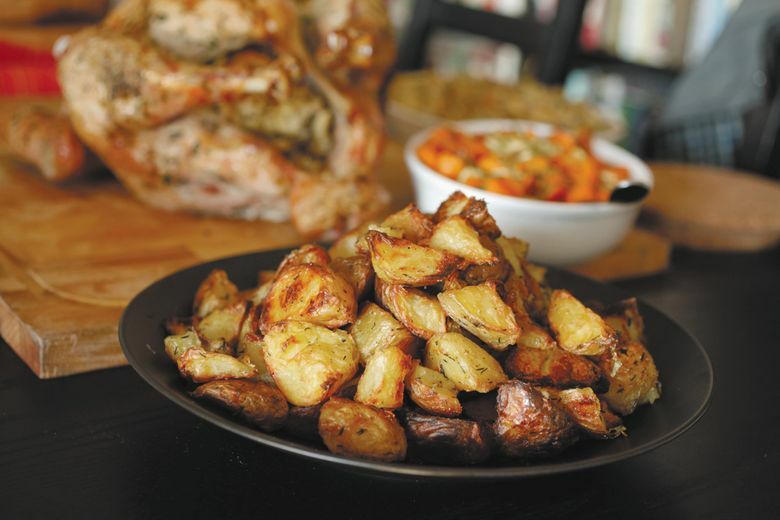 Transfer the potatoes to the baking sheets and roast until the bottoms are crisp, rotating the pans halfway through cooking, about 25 minutes. Test the potatoes by trying to pry one or two pieces off the baking sheet with a stiff metal spatula. If they don’t come off easily, roast for additional 3-minute increments until they do. 3. Flip the potatoes with the spatula, making sure to get all the crisped bits off the bottom, then continue to roast until golden brown and crisp all over, about 25 more minutes. Transfer to a serving bowl, season to taste and toss with chopped herbs.